This room is spacious and very comfortable, with a solid pine four poster bed and quality coordinating furniture and soft furnishings. Decorated in rich tapestry colours it offers a warm and romantic atmosphere. Overlooking the quiet rear garden it is a perfect oasis for a romantic break. The antique oak four poster tester bed dominates this room and evokes memories of an historic England, of medieval and chivalrous times. Inscribed with an ancestors initials one can only begin to imagine the history attached. This room has a black and gold wrought iron bed in the gothic style. 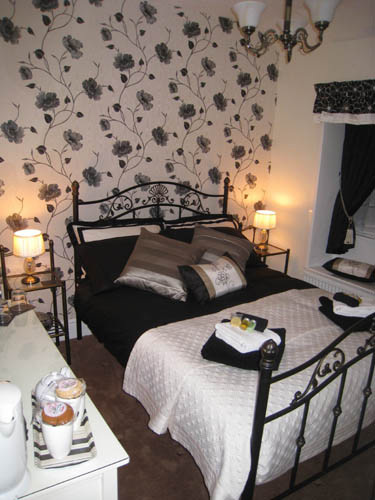 This luxury double room has a black white with silver flower feature wall with fine furnishings. A new en-suit with walk-in shower compliments this room. The room is on the second floor to the front of the cottage. 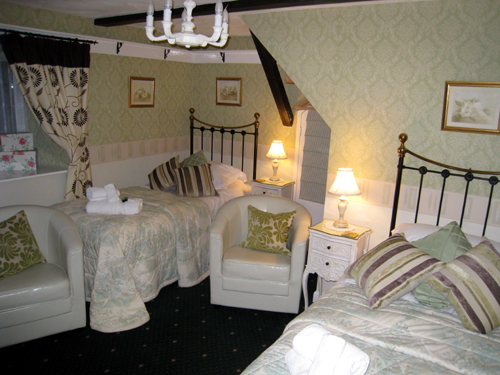 This is a twin room where comfort is not compromised, the room has two single luxury beds with wrought iron bedsteads. It has a light and airy feel to the room due to the large window and tasteful decor. and is situated on the lower ground floor. 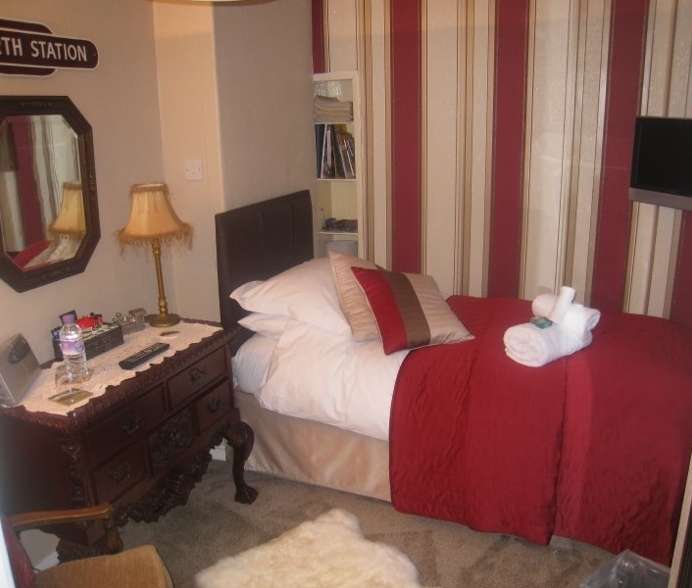 A smaller room unable to accommodate a Double bed but very comfortable with a Single luxury bed. This room has a luxury corner bath and power shower en-suit. The soft furnishings and luxury throws are cream and brown in colour and nostalgic pictures and memorabilia of the steam railways adorn every available wall space. The sound of steam can also be heard from this room as the railway line runs just across the lane.